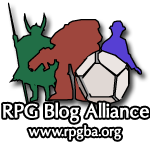 Good sourcebooks give you usable material for your campaign and characters. Great sourcebooks inspire brand new campaigns. 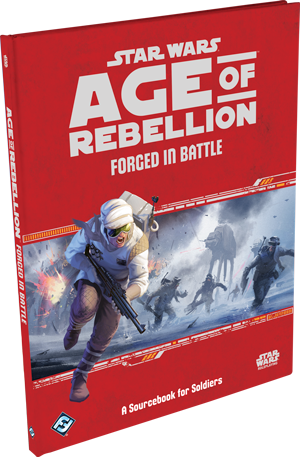 The Age of Rebellion sourcebook for soldiers Forged in Battle falls into the latter category. 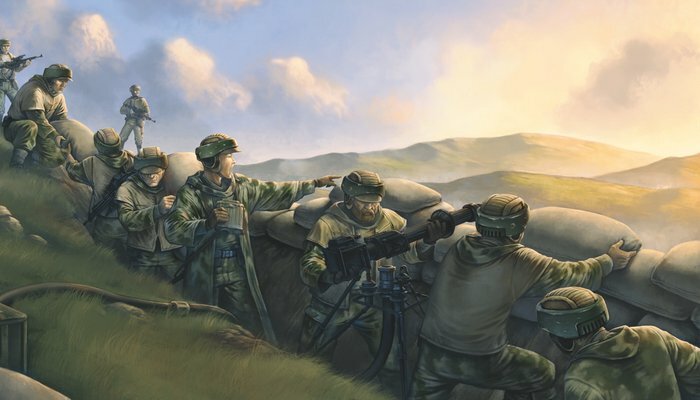 This book follows the now familiar format of three sections: new player options with new races and specializations for the career, new gear and vehicles, and finally a section for GMs about adventure seeds and building missions around soldiers. From the jump, before we even get in to the new races this book describes potential duty posts. Each of these could be their own campaign, or at very least the premise to start a larger story arc: Local cells, sector forces, specforces, shipboard operations, intelligence services, and special operations. Between the soldier specs in the core Age book and the ones in this one, you could have a very capable versatile squad, all with the same career! This book is packed with the perfect blend of fluff and crunch. For those unfamiliar, fluff in an RPG typically refers to flavor text and window dressing that paints a vivid mental image, but has no mechanical/statistical information. Crunch is generally the numbers and stats of gear and mechanics of new talents and anything that interacts with the actual mechanics of the game. On to the goods: There are a bunch of great backgrounds for the various specializations, as well as soldier-specific duties. This book then details four new races: Elom, Elomin, Kyuzo, and Shistavanen. 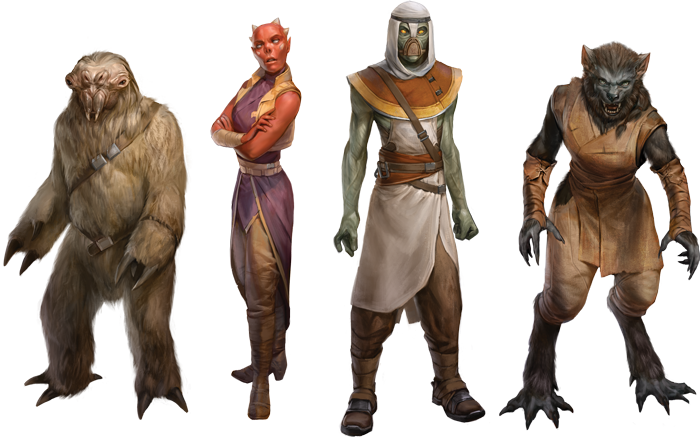 Much like the Edge of the Empire technician sourcebook Special Modifications including Northern and Southern Mustafarians, Elom and Elomin are from the same planet, but are vastly different species. The Elom and Elomin are so different they merit their own individual stat blocks, not just different starting features. Eloms are pretty much mole people that can dig underground through loose soil as a maneuver. Elomin look a lot like Zabrak, but just because they have four horns out of the top of their heads. Kyuzo is the race of one of my favorite bounty hunters from the Clone Wars, Embo. Included in the gear section are stats for his hat that can be used as a Captain America style shield/throwing weapon, and occasionally downhill sled. It also goes in to detail about Clovocs of the Kyuzo that sound basically like ninja clans that specialize in a certain weapon, and may align themselves with different leaders in Kyuzo society. Lots of adventure seeds in those sidebars. Finally there are the Shistavanen. If you want to play a wolfman in Star Wars, this is your ticket. Alternatively if you wanted to play a wolfoid from Metamorphosis Alpha or a Vargr from Traveller, but the GM is running Star Wars, check out the Shistavanen. One really cool feature is they can use Survival rather than Cool or Vigilance for initiative to literally sniff out trouble. The specializations include one repeat and two new trees. The repeat is the Heavy from the Edge Hired Gun sourcebook, Dangerous Covenants. This tree is all about using the biggest weapons to take down the biggest targets. To the core Soldier skills of Athletics, Brawl. Knowledge (Warfare), Medicine, Melee, Ranged (Light) Ranged (Heavy) and Survival, the Heavy adds Gunnery, Perception, another Ranged (Heavy) and Resilience. Not bad for the big blaster obsessed players out there. The second specialization is the Trailblazer. This is a nice combination of combat and outdoorsy skills. To the core skills, this adds Knowledge (Outer Rim), Perception, Stealth, and another Survival. Interesting talents early in the tree include Prime Positions which allows this PC or an ally within short to increase the soak against ranged attacks by 1 per rank. There is only one rank in this tree, but I imagine we’ll see this pop up in future supplements as well. Cunning Snare can be used to create a trap once an encounter. This can cause wounds and disorient based on the Trailblazer’s cunning, and how badly the triggering NPC fails his vigilance check to spot it. On the bottom line of the tree is Ambush, which allows you to maneuver from cover and add damage equal to your stealth skill on an attack within short range. I really like this specialization as a backwoods Rambo-type. In fact, I would be surprised if Rambo wasn’t an influence when it came to this spec as well as some of the gear later in the book. The last spec is the Vanguard. They add another Athletics, Cool, Vigilance, and Resilience to the core skills. When I think of a vanguard, I think of the tip of the spear, always leading the attack. This tree includes a lot of focus on the guard part of Vanguard with two ranks of Body Guard available, as well as new talents Improved Body Guard and Supreme Body Guard. These allow you to to take a hit for an engaged PC you protected with the body guard maneuver. Supreme allows you to protect as many engaged characters as ranks in Resilience. My favorite new talent from this tree is Suppressing Fire. This allows you and allies within short to spend advantage on failed combat checks to cause 1 strain per rank. With two ranks in this tree and it applying to other allies, this is one awesome power to take out minions in a hail of concentrated fire. One of the talents at the bottom is Seize the Initiative. Once a session if you make a hard athletics check, all PCs can take their turns immediately. Now that is a Vanguard. Both signature abilities are pretty cool in this book. The Bigger They Are… allows the character to try and take down vehicles, ships, or creatures of silhouette 2 (3 with an upgrade). If a knowledge warfare check succeeds the PC and friendlies within medium can attack with personal scale weapons, ignoring armor or soak. This calls to mind the scene from the new Rogue One trailer when the soldier launches a missile at the side of an AT-AT head. If I’m not playing in an Age Special Forces campaign before Rogue One, I imagine I will be shortly thereafter. The second signature ability is Unmatched Courage, which allows the PC to ignore effects of critical wounds for the duration. With upgrades, this allows you to not become incapacitated after your wound threshold is exceeded. You still suffer crits for any additional hit, but you keep going. The gear section includes a number of nice new rifles, and massive guns for the Heavies. Of note is the T-7 Ion Disruptor that featured prominently in an episode of Rebels, and was used against the Lasat in a massacre lead by Agent Kallus. There is also a pulse cannon that has an option to expend all its ammunition in one shot to add Breach 1 and Vicious 3. It is slow-firing, but not a bad idea to keep one around in case you need to make a big hole in something. The Imperial heavy repeater slugthrower has a similar quality in which you can expend all its ammunition to add Blast 7 and Concussive 1. The armor section includes some new stealthy suits, as well as Rebel Heavy Battle Armor and Imperial Hazard Trooper Armor that includes protection from hazardous environments, as well an internal comm that can reach low orbit and a targeting system that removes two setback from darkness, smoke, or similar environmental factors. The Shistavanen Combat Utility Blade features many possible configurations but may contain a fire-starter, a hydrospanner, water contaminant detector and functions as a toolkit to repair devices and droids, but adds a setback die to such checks. It also adds a boost to survival checks. So pretty much a Rambo knife. Also of note in the gear section is the modular backpack. The basic storage unit just adds encumbrance capacity as normal, but there are other units that help control temperature in hazardous environments, power weapons or tools, mobile communication hub, sensor suite, or oxygen supply. Lots of cool options to kit out your squad with different gear depending on the mission. 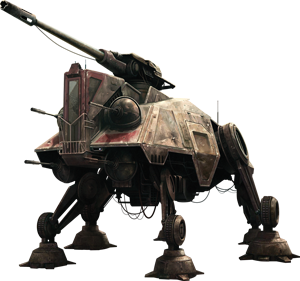 Vehicles include the 6-legged Clone Wars era AT-TE, as well as an Imperial Troop Transport that sounds like the one used commonly on Lothal in the Rebels TV show, as well as a repulsor tank that looks a lot like the old Cobra H.I.S.S. tank. Also from the Clone Wars era, LAAT/I and LAAT/C used as both troop and vehicle transports in the prequels and Clone Wars shows. These would be a fun way to get into and out of battle. The final section is dedicated to the GM and how to integrate soldiers in missions that focus on other careers as well. Included are sample missions and possible strike targets, asset denial, and a Coup D’Etat of a planetary governor. Beyond those scenarios it provides ideas for different battle environments like trench warfare, urban fights, and raiding operations. Near the very end there is a really cool section on building fortifications as well as suggested ways to spend advantage/threat and triumph/despair on those constructions. It also details how to spend different results in different environments from city battles to boarding actions and wilderness combat. The very end of the book describes soldiers learning talents after recovering from critical injuries. The idea being that which doesn’t kill you makes you stronger. It is an interesting concept, and could definitely add a lot of flavor to a soldier since you’ll likely be in the thick of it for most adventures. It also talks about possible trophies that soldiers may collect like an Imperial Officer’s cap and how they could add a boost die to coercion checks against imperial troops. Overall this book is jam packed with awesome material for GMs and players alike. If you are playing a combat-focused Age game, this is a must-have. If you are interested in putting together an A-Team or X-COM style squad of soldiers with various skills that when combined can pull off amazing missions, this is the book for you. Between Sharpshooters, Medics, Heavies, Commandos, Trailblazers, and Vangaurds, I would argue Soldier is now one of the most diverse and well-balanced careers in the entire FFG Star Wars system. You will be hard-pressed to find another career in which every PC could play a soldier with a different specialization and end up in such different roles. Highly recommended. Clearly, I’m a huge fan of the FFG Star Wars line, and often they knock it out of the park. This review, however, will be mixed. 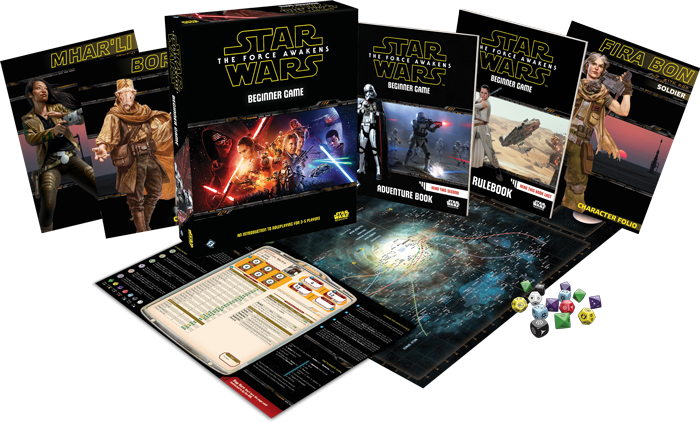 One can’t blame FFG for cashing in on Star Wars mania since episode VII came out. On the Order 66 podcast some FFG staff members reported a surge in sales after the movie release. Unfortunately, in this most recent (and likely last) beginner game, they cut some serious corners. First the good: The materials include stats and details for New Republic-era First Order baddies, including Captain Phasma herself! It also updates the included galaxy map found in any of the core books with new locations of episode VII scenes: Jakku, D’Qar, Takodana, and Starkiller Base. The rulebook includes some background information for the different factions like the New Republic, the First Order and the Resistance. As in previous beginner boxes, the adventure continues with a PDF supplement on the FFG support page for the product, so you can get a few gaming sessions out of it. The bad: There are no additional PC folios on the support page for the product. This means there is a GM and 4 players maximum. Also, 3 out of 4 of the PCs are human. Out of all the interesting alien races in all the Star Wars products from THREE different product lines, and there is ONE alien? You could mix and match character folios from other beginner boxes or create a few supplementary PCs, but that assumes you own other boxes or have enough familiarity with the system to create them. This makes running the beginner box at a convention or a FLGS more difficult. I’ve run the previous boxes for groups new to the system, and typically at conventions you have 6 PCs and a GM. All previous beginner boxes shipped with 4 folios and included 2 PDFs in the support section for the product so you could fill out the table. Also, the additional adventure PDF is several pages shorter than previous versions for Edge, Age, and F+D. The map (which is one of the main draws to purchase this for many veteran players) is only 17″x 22″ which isn’t too bad, but the flip side contains both maps used during the adventure. This puts them at such a tiny scale that they are almost unusable. On one half, First Order Troop transports are represented as being about two inches long, with a TIE fighters in racks on the walls being about 1/2′ x 1/2″. That is not a great personal scale map. The other half is an entire length of a Corellian Corvette which is a massive ship! It feels like those were supposed to be the two sides, which would have worked, then someone said, “Let’s add a galaxy map!” Instead of adding a separate poster with something cool like Jakku planetary locations on the reverse, they shoe-horned it into the player/scene map poster. Very disappointing. Finally, with the exception of the PC folio portraits and maps there is no new art in the product. This is a huge missed opportunity and gives the appearance of cutting corners as all the illustrations are movie stills or promo shots from the movies. 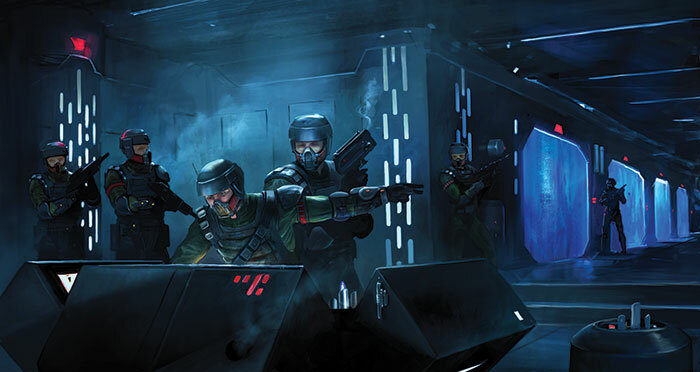 The reason I buy FFG Star Wars books is for the amazing art. Just think of Rey, Finn, Poe, Phasma, etc. in brand new scenes from the amazing stable of artists FFG commissions. Such a shame. 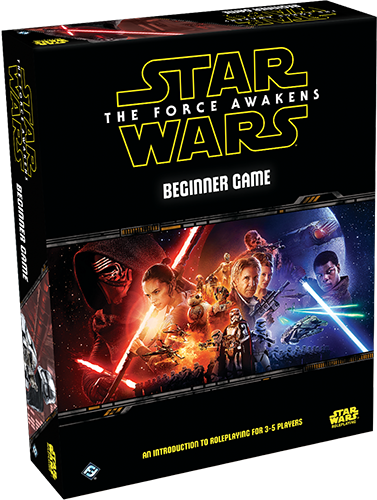 Overall, this is the first FFG Star Wars product I would suggest skipping. It feels rushed, and doesn’t provide the same great experience as previous boxes. It’s not bad if you need an extra set of dice and want a pretty nice galaxy map to illustrate other adventures, but this is a pretty low value product for the money. Hopefully, this is not indicative of a new direction for FFG RPG production, and merely a one-off to capitalize on movie hype.